I've got one more recipe for your before the big turkey day. This one also uses up some of those Thanksgiving leftovers. Not only turkey, but also sweet potatoes, if you haven't mashed them all, that is. This one uses cubed sweet potatoes. I created this recipe last winter. Heat olive oil in a large skillet over medium heat. Sauté apple and onion until soft. Add flour and stir until incorporated into the oil. Slowly whisk in turkey stock. Add turkey, sweet potatoes, poultry seasoning, and salt. Cover skillet and bring to a boil. Reduce heat to low and cook for another 5-10 minutes or until gravy is thickened. This is really yummy. I love how the sweet and savory flavors meld together so well. 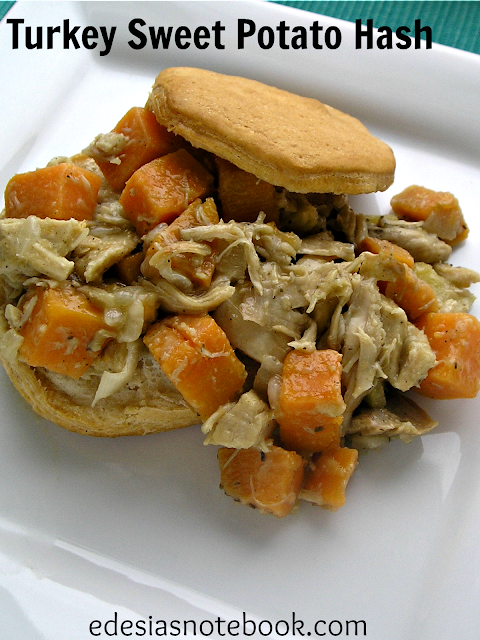 The sweet potatoes and apples bring a little sweet, but the onion, turkey, and buttery biscuits make it decidedly savory. If you don't have leftover cooked sweet potatoes, it's really easy to make some. Cube up 1 lb. of sweet potatoes (1" cubes) and you can either steam or boil them on the stove top. I actually use my Pampered Chef Microcooker, which is used in the microwave. Super easy. Any way you do it, make sure to leave the potatoes a little bit al dente, since they will continue to cook after you add them to the skillet. I'm listing this as one of my "mock Thanksgiving" recipes because it is reminiscent of Thanksgiving flavors if you make it at other times of the year. Put some cranberry sauce and green beans on the side and you're good to go! I wish you all the happiest of Thanksgivings! First time here. Amazing preparations and photos. The cake looks yummy. Bookmarked. We have also a foodblog mainly specialized in South Indian recipes. Take a look and drop your comments too..
Mmmmm, I love hash and I love biscuits! This looks amazing!